No parking allowed on Saddle Ridge road. Short and sweet with fast flowy downhill and minimum uphill. This trail is one of the newest in Crested Butte, and it's built with mountain bikers in mind. It's also one of the first trails to melt off snow in the spring due to the south facing sunny slope. This trail makes a great connector or fast after work ride. Many riders will ride this in conjunction with Snodgrass or Lower Loop for a longer ride. The views of the Slate river valley are stunning with blooming Lupine and various other flowers in Summer. Fun coasting trail with a great view of the valley. The aspens on Lupine and Gunsight can't be beat. Riding through fields of Lupine. Heading up from town on Lupine. Short flowy segments through Aspen groves. 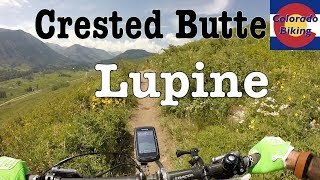 Riding through aspens on Lupine Trail. A view from Lupine. Watching the rain roll in. Scenic views from Lupine Trail.